Fully illustrated with stunning full color artwork, this is the fascinating story of arguably the world's first "modern" air campaign. Following the failure of Rolling Thunder US aircraft were now armed with new technologies such as new laser-guided bombs and electronic warfare capabilities. The Air Force now had the fearsome AC-130 gunship and a new generation of Wild Weasel anti-radar aircraft, and the US Navy aviators now had much better dogfighting training thanks to the new TOPGUN fighter school. As the Paris peace talks floundered in early 1972 and the US began to disengage from Vietnam, it was clear that the North Vietnamese were conducting a major build up for an attack into South Vietnam. 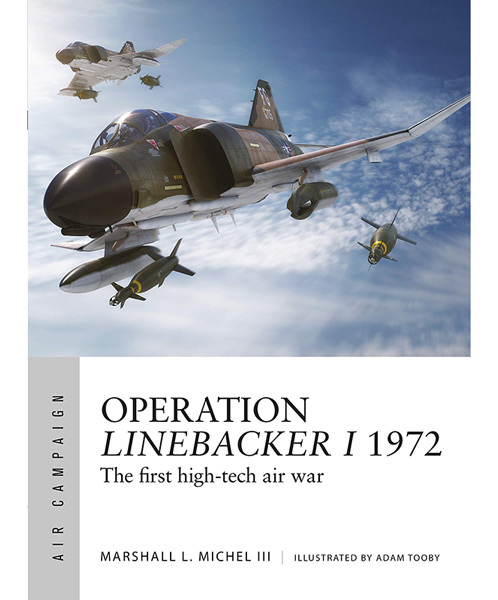 Screened by bad weather and heavy air defenses in the north, the attack advanced quickly but the US quickly pushed back with an air campaign named Operation Linebacker. Their objective: defeat the invasion, preserve the government of South Vietnam, and bring the North Vietnamese back to the Paris peace talks.